북한 평양은 '초대형 쇼룸' 또는 '영화 촬영장' 같다고 말 할수 있다. 외국인이 서울을 보고 남한을 다 아는것 처럼 말하는 것과, 평양을 보고 북한을 다 아는것 처럼 말하는 것은 큰 차이가 있다. 서울에는 부자 동네가 있고 아직도 연탄을 사용하는 가난한 동네도 서울에 있다. 수많은 사람들이 이용하는 서울역 용산역 청량이역 일대에는 노숙자가 있다. 그러나 평양에서는 노숙자를 찾을 수 없다. 그들은 '이주 제한법'이 있다. 평양에는 당에 대한 충성성이 탁월하거나 군, 정 과학자 등 엘리트만 사는 도시가 평양이다. 기사에서 동영상 캡처로 나타나는 사진 속의 젊은이들은 평양의 김일성대학생, 북한의 엘리트로 이해 하면 될 것 같다. 랭크한 북한의 '홍보동영상'을 보고 북한의 일상으로 봐서는 북한 이해의 잘못이 될 수 있다. 미국의 북한전문매체 '38노스'는 조선중앙TV를 인용해 북한의 무선인터넷 접속 스마트기기 및 무선인터넷 서비스 '미래'를 자세히 소개했다. 보도에 따르면 조선중앙TV는 지난 10월21일 만경대해양기술교류사가 개발한 신형 판형컴퓨터(태블릿PC) '대양8321'을 대대적으로 소개했다. 해당 기기는 사용자식별카드(SIM카드)를 꽂으면 무선으로 인터넷 연결이 가능하다. 북한은 아울러 무선인터넷 연결이 가능한 신형 스마트폰 '아리랑171'도 소개했다. 해당 기기 역시 SIM카드를 이용해 무선인터넷 접속이 가능하다. 해당 기기는 아리랑정보기술교류사가 시판 중인 것으로 알려졌다. 북한은 이들 기기의 무선인터넷 접속 장면을 내보내며 "시간과 장소에 구애받지 않고 노동신문 등 여러 홈페이지에 접속해 필요한 과학기술자료를 신속히 열람하고 내리적재(다운로드)받을 수 있다", "김일성종합대학과 김책공업종합대학의 원격 강의도 받을 수 있다"고 홍보했다. 38노스는 이들 기기가 접속하는 무선인터넷망에 대해 "(서비스는) '미래'라고 불리고 평양 중심부에서 가동된다"며 "북한 매체에 실외 와이파이 서비스가 거론된 건 이번이 처음"이라고 설명했다. '미래'의 데이터서비스 속도는 최대 70Mbps로, 국내 기준 3.5G 수준이다. 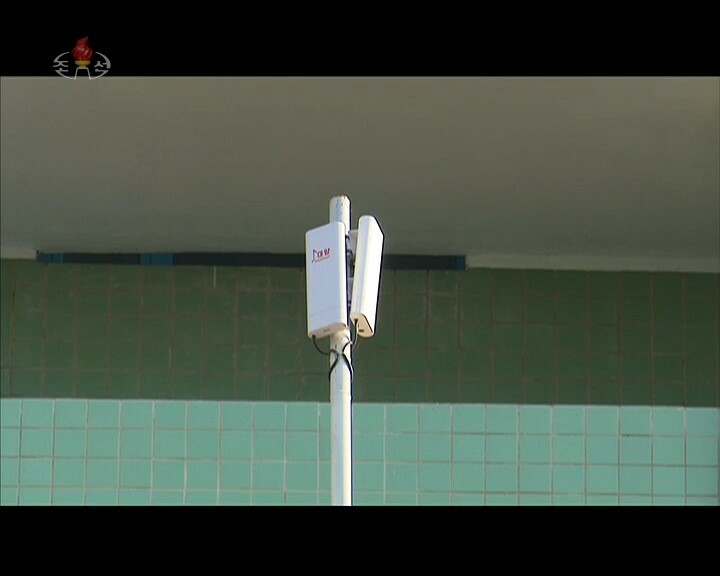 Korean Central Television recently broadcast a couple of reports about a new outdoor wireless data service in Pyongyang. The service is apparently based on Wi-Fi but unusually requires a SIM card for access. It’s called “Mirae,” which means “future,” and is up and running in central Pyongyang, according to the reports. 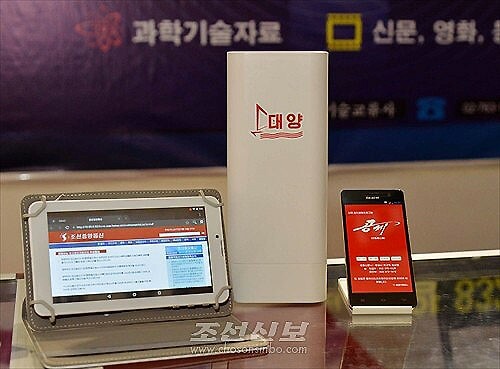 It’s the first time an outdoor Wi-Fi service has been mentioned in North Korean media and runs alongside two cellular networks operating in the country that provide wireless data service. Both the Wi-Fi and cellular services offer citizens access to North Korea’s nationwide intranet and not the global Internet. In the report, a regular SIM card was shown being inserted into the unit. SIM cards are typically used for cellular services, but the TV report didn’t specify the type of network being used. An earlier report in Japan’s Choson Sinbo newspaper and a later TV report said it is a Wi-Fi service. The TV report showed the service in use via a pair of antennas installed above a pedestrian area that appear to be outdoor Wi-Fi base stations. The same antenna was shown in a report about the new service in the Japanese Choson Sinbo newspaper in August. It showed the Daeyang 8321 alongside one the antennas and what appears to be an Arirang 171 smartphone. The data speed of the service is said to be up to 70 Mbps, which is a speed attained by Wi-Fi and cellular 4G services. To-date, North Korea is not known to have a 4G network. The report did not mention much about the network but said the smartphone—again, likely from a Chinese OEM supplier—featured a fingerprint reader and access to the Mirae network through a Wi-Fi SIM card.